Originally published in the WHO Goodwill Ambassador’s Newsletter for the Elimination of Leprosy, Issue No. 7 (April 2004). The information was correct and current at the time of publication. Her situation got worse before it became better, but in the end, as Birke Nigatu relates, her story has a happy ending. I developed leprosy when I was only six years old. At that time, I was living with my grandmother as my parents had divorced. When the symptoms of leprosy first appeared on my face, my relatives took me to a traditional healer, health centers and hospitals; they even tried witchcraft, but all to no avail. Surprisingly, neither the health centers nor the hospitals identified the disease. But the last hospital I visited referred me to an Alert Hospital (which specializes in leprosy) and I went there with my mother. When the doctor said I was affected by the disease, my mother cried and said it was a curse. Afraid of the stigma, she warned me not to return to the hospital again. By this time, she had started a new life, and did not want to go through another divorce. But she didn’t realize the impact of her decision on my life. I spent four years without receiving treatment, simply because I didn’t have access to it. Gradually, my fingers became clawed. When I showed my mother, she just told me to rub them, saying we had no history of such a thing in our family. Leprosy is like any other disease. It is curable. By now I decided to seek treatment by myself. I borrowed the bus fare and went back to the Alert Hospital, where the doctor told me I should be admitted. Thanks to the treatment I received, I was cured, although I was left with small disability in my fingers and toes. Rather than return home, where my presence would have humiliated my mother, I decided to lead my own life. Not only had leprosy left me disabled, it had also isolated me from my parents and relatives. Increasingly, I cut myself off from people. But then I learned how to embroider using my disabled fingers, and this skill is what restored my dignity. I said to myself that with God the Almighty, nothing is impossible. Today I am married with four daughters, and lead a contented life as a person without leprosy. I even became a pioneer for many people affected by leprosy, encouraging them to walk away from begging and take up embroidery. For me, leprosy is like any other disease. It is curable. Besides, disability is not an inevitable consequence of leprosy. Even those of us with disabilities can participate in productive activities according to our ability. I believe that the disabled should not be dependents; they should not be beggars. I acknowledge, though, that the disabled, especially those disabled by leprosy, face many problems that sometimes seem overwhelming. In that situation, integrated effort is called for, and we must do all we can to help them. 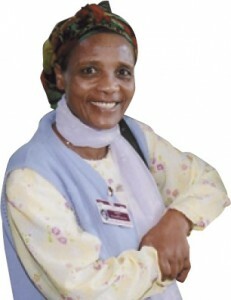 Birke Nigatu is chair of the Ethiopian National Association of Ex-Leprosy Patients, an organization established to help former patients, advocate on their behalf and raise awareness of leprosy issues.